Concerned Veterans for America called in a statement released on Friday for a new design for the Dwight Eisenhower Memorial in Washington, D.C., to replace the controversial proposal submitted by the architect Frank Gehry. "It’s time to honor Ike with a new design—not just for World War II veterans, but for all veterans—and all Americans—both today and tomorrow," the statement said. The veterans group’s announcement is the latest incident in a years-long argument over Gehry’s design, which was selected by the Eisenhower Memorial Commission in 2009. "We firmly believe that General Eisenhower deserves a fitting national memorial that embodies his values and inspires veterans and all Americans. Unfortunately, Frank Gehry’s memorial design utterly fails at that task," the statement said. Gehry’s design features three bronze statues of Dwight Eisenhower in different periods of his life: as Supreme Allied Commander during World War II, as president, and as a lanky Kansas farm boy seated casually on the memorial’s stone wall, contemplating his future. Dwarfing the memorial’s statuary is a 400-foot-long steel tapestry "artfully woven and welded" to depict a grey landscape from Eisenhower’s hometown of Abilene, Kansas. The steel mesh is held aloft by unadorned limestone columns eight stories tall and 10 feet in diameter. Much of the criticism directed at Gehry’s design has focused on its steel screens and columns, which are a departure from other memorials in the D.C. area. The backdrop, the group said, is inappropriate for the memorial of a legendarily modest subject. 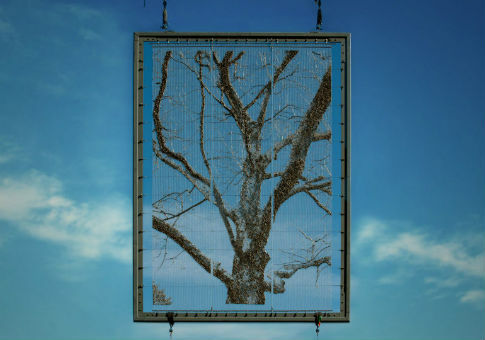 Justin Shubow, president of the National Civic Art Society and a leading critic of Gehry’s design, said that the bare trees depicted on the steel tapestry suggest "permanent winter—a bad allegory" for Eisenhower’s life. The tapestry, Shubow added, is larger than the Hollywood sign in Los Angeles. Critics contrast the backdrop with the diminutive statue of a young Eisenhower at the memorial’s center. "The focal point of the memorial by Frank Gehry is unrecognizable," said Shaun Rieley, a research analyst at Concerned Veterans for America, at an event on Friday. "It cuts him down to size." Gehry’s proposal has been polarizing as heavy hitters have lined up to argue for and against the design. Opponents have pointed out that Eisenhower’s surviving family is united in opposition to the memorial. David Eisenhower, the president’s grandson, resigned from the commission in 2011. Other relatives have publicly criticized the Gehry design. "When I look at this memorial, I don’t see any bit of him in it," Susan Eisenhower, the president’s granddaughter, told NBC in 2011. The Eisenhower Commission has pointed to the all-star cast of its advisory board, which includes three former presidents—Carter and both Bushes—and three former secretaries of state—Henry Kissinger, Madeleine Albright, Condoleezza Rice—among others. If the commission stands by Gehry’s design, it will rely on private donations to cover much of the memorial’s projected $144 million price tag. Last year Congress rejected the commission’s $49 million budget request to begin construction on the memorial, allocating only $1 million to keep the commission operating day to day. On Friday, the National Civic Art Society unveiled a proposal to reboot the design process and find a memorial "acceptable to all sides" within five years. It recommended that the Eisenhower Commission hold a new design competition open to all Americans, in contrast with the closed contest that selected Gehry’s design. The proposed competition would require that designs be "modest in scope and scale" in keeping with the wishes of the Eisenhower family. It would also cap the memorial’s cost at $25 million, a sum comparable to the budgets of the World War I Memorial and Pentagon 9/11 Memorial. Chris Cimko, a spokeswoman for the Eisenhower Commission, said that the groups intend to move forward with Gehry’s design, disputing critics’ contention that the project needs a reboot. "We don’t feel like we’re at a standstill at all. We’re moving forward," Cimko said.